“The continued American military buildup in the South China Sea through the transfer of war materiél to puppet Philippine troops under the cloak of the US-RP MDT continues to stoke conflicts with China, instead of help resolve it peacefully,” said the CPP. “The US plan is clear: heighten its military presence in the South China Sea in order to contain China’s growth and make it more compliant with US demands for the further opening up of its economy and the dismantling of state-owned enterprises, while provoking China to build up its military strength and stoking conflicts in order to justify the further buildup of US military presence in the region in the name of ‘freedom of navigation’ and other US imperialist-contrived principles,” added the CPP. 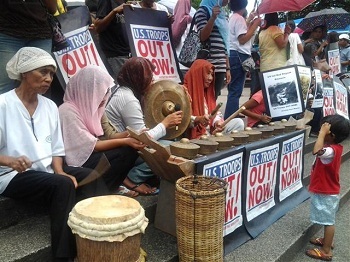 “The Aquino regime is shamelessly toadying to the US strategy and surrendering Philippine sovereignty to the US only for the privilege to be allowed to acquire a few discarded American scrap military hardware,” said the CPP. “The Aquino regime’s mendicant foreign policy is in full throttle when it sought to have the US state a clear position favoring Philippine claims over the Spratly islands and Scarborough Shoal while presenting the US government with a wish list of military hardware including sea patrol vessels, aircraft and radars. This entry was posted on May 5, 2012 at 9:40 pm	and is filed under Nepal News. Tagged: CPP, Philippines. You can follow any responses to this entry through the RSS 2.0 feed. You can leave a response, or trackback from your own site.